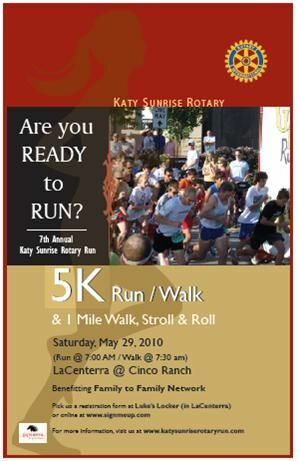 The 7th Annual Katy Sunrise Rotary 5K Run & 1-Mile Walk, Stroll, or Roll benefiting Family to Family Network helping families of children with disabilities will be held on Saturday, May 29, 2010. The mission of Family to Family Network is to help families of children with disabilities by providing information, training, referral and support. Runners, don't miss this! The 5K Run features ChampionChip Timing and a USATF Certified 5km Course! Sign up now and keep this on your calendar as the one to run, walk, or roll every year! To register or find more information, click on the link on our home page for Katy Sunrise Rotary Run!